This book examines the question of when terrorism works. Determining if political violence is effective and, if at all possible, when it is effective, is vital for both intellectual and practical reasons. 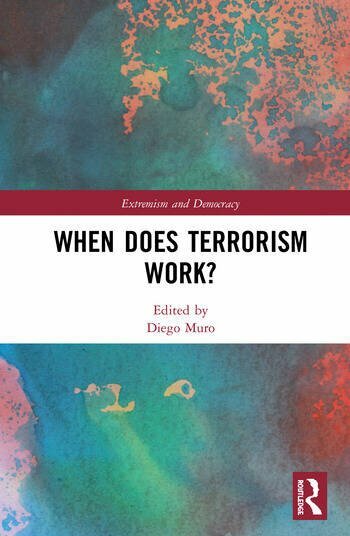 The volume contains chapters from scholars who have been at the forefront of the efficaciousness debate and argues that terrorism can be effective in delivering tactical returns but is largely ineffective in realizing strategic goals. The book considers the pros and cons of choosing coercive intimidation to serve political ends from both a theoretical perspective and case study approach. It also outlines some of the methodological problems inherent in the academic debate that has taken place thus far on the subject, and suggests ways forward for making future scholarship in this area more inclusive, systematic and dialogically fruitful than it has been to date. Dr Diego Muro is Lecturer in International Relations at the Handa Centre for the Study of Terrorism and Political Violence (CSTPV) at the University of St Andrews and Senior Research Fellow at the Barcelona Centre for International Affairs (CIDOB).